There’s nothing more annoying than entering your kitchen and seeing a long trail of the pesky critters ransacking your merienda. Ants may be miniscule, but they sure can raise hell—especially when they summon the whole barangay. There’s nothing more annoying than entering your kitchen and seeing a long trail of the pesky critters ransacking your merienda. It’s enough to drive a hungry soul nuts. That lone ant poking around on your counter may seem harmless, but once that bug reveals his food findings to his buddies, the troops will arrive to wreak havoc on your grub. Squish it, quick! Draw an unbroken line near the place or thing you don’t want ants to reach using chalk, powdered cinnamon, or chili pepper. They hate those, so that should keep them away. 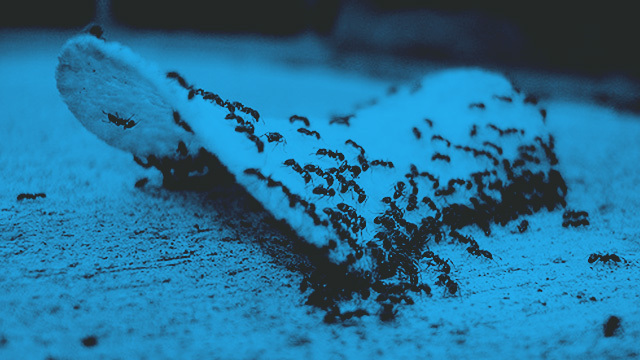 Ants can detect even the smallest morsel of food, so you have to watch out for tiny bits that they can swoop down on. Sweep your kitchen regularly, wipe down your countertop after making a mess, and make sure your oven is crumb-free. Wipe down your kitchen surfaces with a mixture of one part distilled vinegar and one part water. It’s a very effective cleanser, and ants absolutely hate it because it gets rid of their scent trails. Don’t fancy a sour-smelling kitchen? Use fresh lemon juice or peppermint oil instead. A plate crawling with ants is a sight no sane man would ever want to see in his house. Wash all your dishes after every meal, and if you can’t do so immediately, make sure that the pesky bugs can’t get to where your dirty plates are. You’d be surprised at how quickly ants can discover the tiniest holes in plastic and carton packaging. Buy plastic bag clips to keep your bread and chips ant-free, or transfer them to an airtight container. You can also use sticky plastic wrapping for foods that won't fit inside containers, like that ulo ng lechon you still have from New Year's eve. Remember all the times you drowned ants when you were a kid? Apply those sadistic tendencies in real life by creating moats around ant-friendly food. If you’ve got ants crawling on your tables, place the table’s legs in containers filled with water. See if they can get past that! The Many Awesome Reasons Why You Should Grab Our Jennylyn Mercado-Headlined January Issue!